Armored Sealcoating completed this large scale commercial seal coating project this 2018 season in Kenosha Wisconsin. Our goal going into every project is to make your asphalt look like brand new again and function to its full potential. We work efficiently to get a job well done quickly that will leave you in awe of how great your asphalt looks. We start with minor repair and crack filling, then use the highest quality seal coating materials and best practices to make sure it lasts. You can expect our seal coating maintenance to last you up to 3-5 years vs. the typical 2-3 years from most asphalt seal coating companies. All said and done, we want you to be proud of your commercial lot when we’re finished and to look forward to your next seal coating maintenance with us long term. We want to build relationships as well as asphalt masterpieces. Once your commercial parking lot is freshly seal coated, we will then begin striping your lot. Professional parking lot striping is important for both vehicular and pedestrian traffic flow. You want a well laid-out and easy flowing parking structure. You also want to make sure your parking lot striping adheres to ADA guidelines. 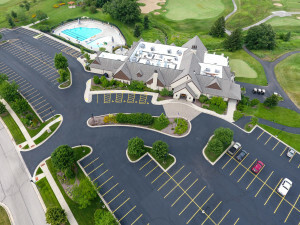 Armored Sealcoating professional seal coat and parking lot striping team will make sure when your project is complete your parking lot utilizes its space effectively while adhering to all guidelines, setting a solid traffic flow pattern, and turns out looking absolutely phenomenal aesthetically. Your lot will be inviting and look fresh and new. 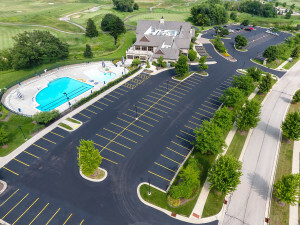 Check out this beautiful, large, inviting, newly seal coated asphalt parking lot. Contact Armored Sealcoating for your free asphalt seal coat estimate today.